Am I mad?! I’m pulling a full Jamie Oliver and I know it. I’m even excited about it. 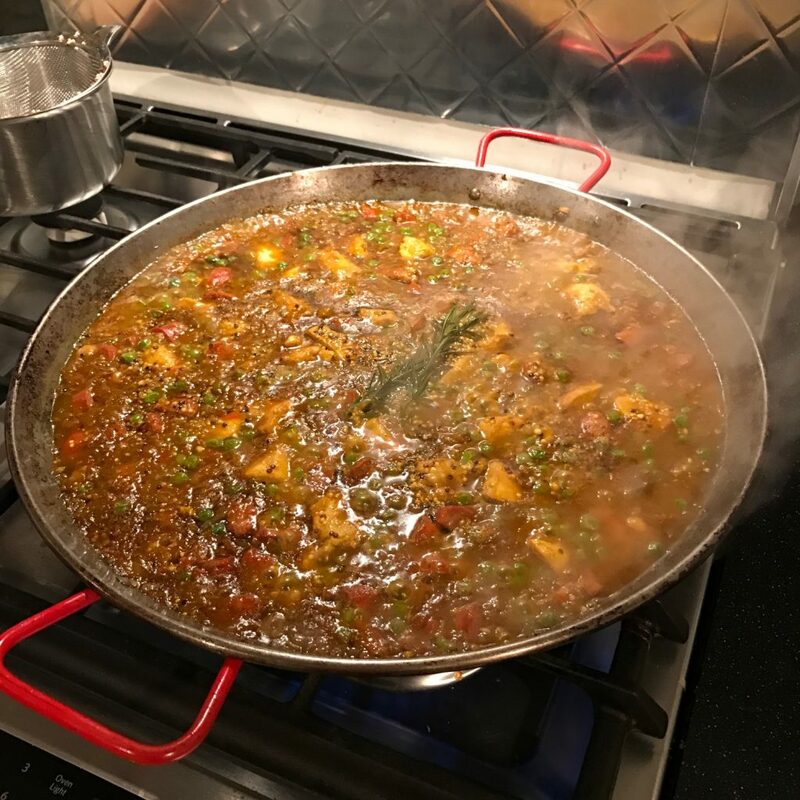 If you aren’t aware of the clamor from the entire nation of Spain after Jamie re-vamped a paella recipe to include chicken and chorizo, let me refer you to the incident here. 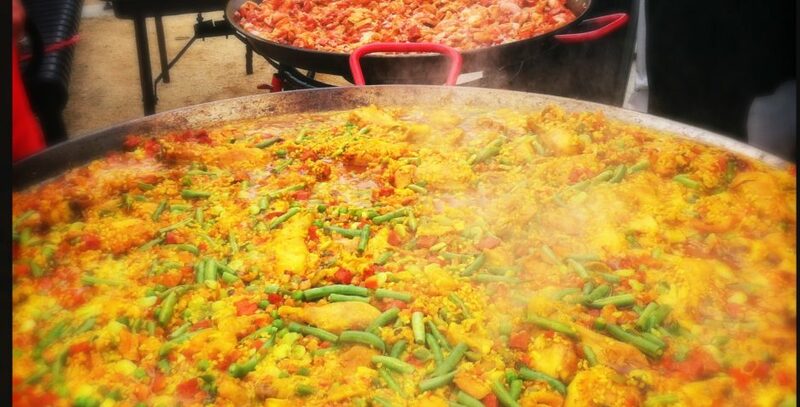 Jamie Oliver’s paella recipe blasted by Spaniards over inclusion of chorizo. But, I’m American, and we are known revolutionaries, so I think I can get away with doing the whole re-vamping thing in a way that maybe a Brit can’t, right? Well, I’m doing it anyway, and feel somewhat justified because I got the stamp of approval from David @ricepaella, a Spanish paella chef from Valencia. In all honesty, he was the inspiration for this dish when he posted MANY unique paella variations, including one that was “Quinoa en paella.” I mean, it makes perfect sense to me to be honest. Then again, I’m not Spanish but I do believe it lies in how one refers to it. Note how David calls it “Quinoa in paella”. Supergrain in paella, simmering on the stove. I didn’t feel like breaking out the gas ring burner. It can be done on the stove, you just have to move the paella around as it cooks. 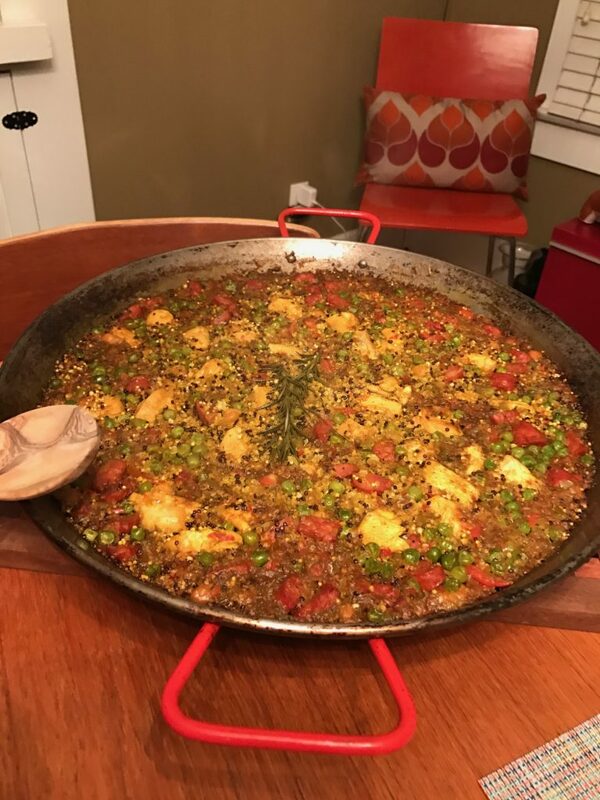 I’m not exactly sure when I HAD to make this paella, but I know sometime between seeing the Instagram post with quinoa made in a paella pan and seeing the super grain mix (red and white quinoa, millet, and buckwheat) at Whole Foods, it had to be done. Why do I say “had to be done?” Once I get something in my head that I want to make, if I don’t cook, bake, prepare, or otherwise fabricate that thing, it will stay in the perpetually un-made stage in my head and drive me nearly mad if I don’t excise it and cook the damn dish! 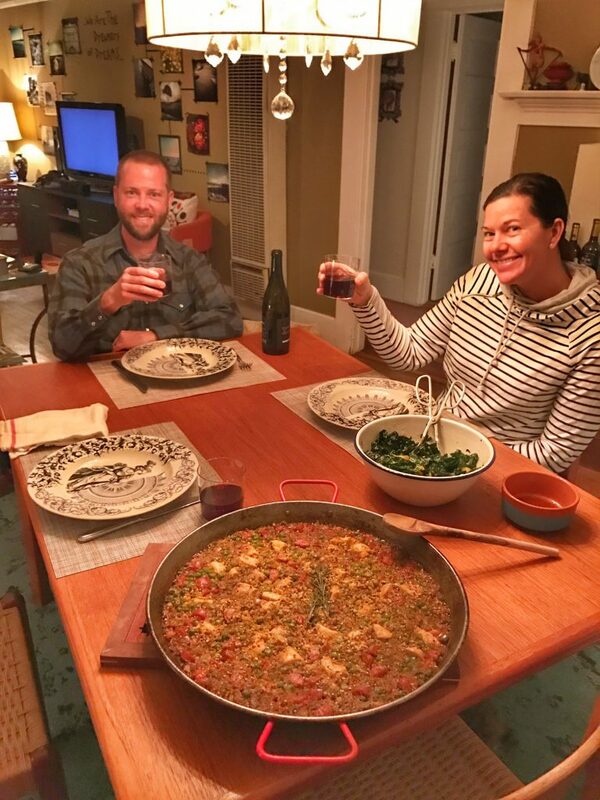 So…during a heart pounding and near vomit inducing Tuesday night workout led by the Gayple female half, I decided that it was THE night to cook the supergrain paella. I’m sorry…I mean supergrain IN paella. On a Tuesday night. It can be done. Gulp. Add the sofrito (peppers, onion, and garlic) and cook, stirring often. Grate the pulp of one large tomato and add to sofrito. Cook mixture until most of the moisture comes out of it and the color darkens. If you are afraid of overcooking the meat, you can take it out while the sofrito cooks. Put the meat back in if it has been removed and add stock/bone broth/liquid to the paella. The amount depends on the amount of quinoa/grain blend being cooked (2 cups for every one cup of grain blend). I added a little more liquid because it was being cooked without a lid. Add paella seasoning (I use a premixed blend of spices procured in Spain. It can be purchased online or in Spanish food specialty stores.) Once the liquid comes to a boil, taste and check for seasoning – adjust accordingly. Add supergrain blend, and while you’re at it add precooked garbanzos (or lima beans) and peas. At this point, we’ve gone completely gone off the track so what harm will garbanzos and peas do?! Indulge me and your creativity! Put a sprig or two of fresh rosemary in the center. Bring mixture to a simmer and cook until all the liquid has been absorbed, adjust the heat as you go to prevent overcooking and burning. Cover immediately with a lid or foil. The paella was resting nicely by the time 2/3rd of the 3 amigos arrived to be the guinea pigs in my latest experiment. I was formulating back up plans should it all go wrong (pasta dinner at the local Italian joint anyone? ), but judging by my doneness taste test, I was pretty sure it would work out for the best. 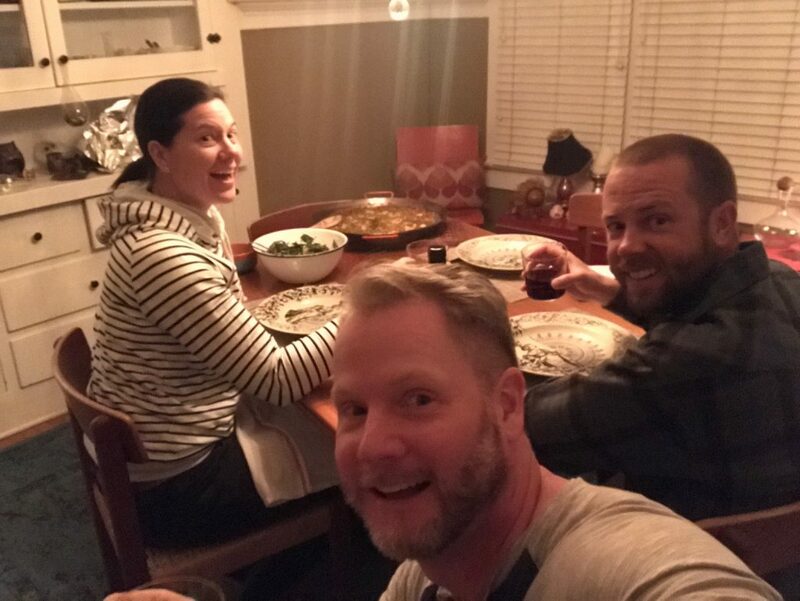 I opened a bottle of delicious Casa Dumetz Mourvèdre, and not only did I have some solid friends joining me for dinner on a Tuesday night, we had more than your typical middle-of-the-week dinner. With a little willingness to experiment (and truth be told, buck tradition a little bit), we had a paella full of delicious grains that had the soul and spirit of a rice paella. I do like a good heaping mound of rice, but it’s nice to eat guilt free now and then and still get the feeling of having your favorite meal! Ok. OK, I know… We don’t have to discuss the wine consumed that night (after all, red wine is full of antioxidants). Hit play below if you’d like to see a recording of the diners reaction, but only if you aren’t easily offended by a f-bomb (the good kind, of course)!! Happy eaters, happy cook. P.S. Spain – please let me back in next time I visit. Gracias.